Plaque reads: In the year 1946 Carl Milles created "God on the Rainbow" as a peace monument to celebrate the founding of the United Nations. Marshall M. Fredericks, American sculptor and assistant to Carl Milles for many years, made the sculpture in full scale from Carl Milles' original in bronze at Millesgården. The inauguration of the sculpture was performed by H.M. King Carl XVI Gustaf on the 8th of September 1995. The sculpture was erected by Nacka Strand Forvaltnings AB. The stainless steel bow was made by Avesta Sheffield AB. 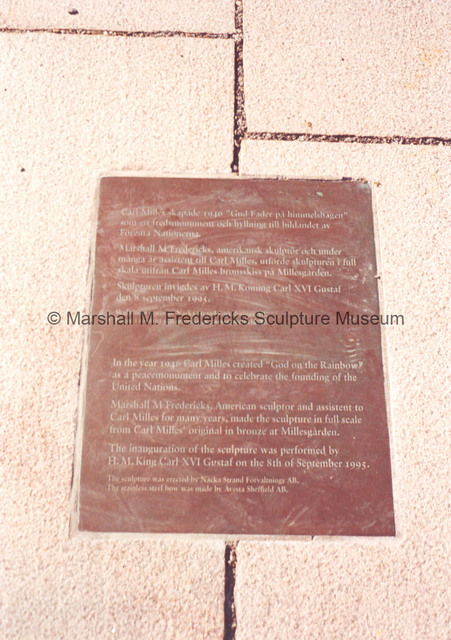 “Plaque for "God on the Rainbow" (Gud Fader På Himmelsbågan),” Marshall M. Fredericks Sculpture Museum, accessed April 22, 2019, http://omeka.svsu.edu/items/show/2171.